I love making pasta. There is something about rolling the pasta through that Imperia pasta making machine that does it for me every time. A few weekends ago I went to my sister’s house to show a friend of hers how to make pasta. My big sister is a wonderful cook. She has been cooking for a lot longer than me. However she does not make pasta. Not that she hasn’t – she has a terrific pasta making machine that is sitting in her pantry gathering dust. It just isn’t her thing. So I went over a few Sundays ago armed with an apron and my Imperia pasta making machine. We didn’t just make pasta, we made agnolotti (a type of stuffed pasta). In fact we made them for 9 people. That is a LOT of agnolotti. We used 1 kg of flour (a combination of 00 and semolina flour) and 10 farm laid organic eggs. As we had two pasta machines, it made it easier to teach another person. It was a lot quicker as well. The eggs were very fresh – collected a few days before – and the egg yolks were very yellow, so we made beautiful glossy yellow pasta. 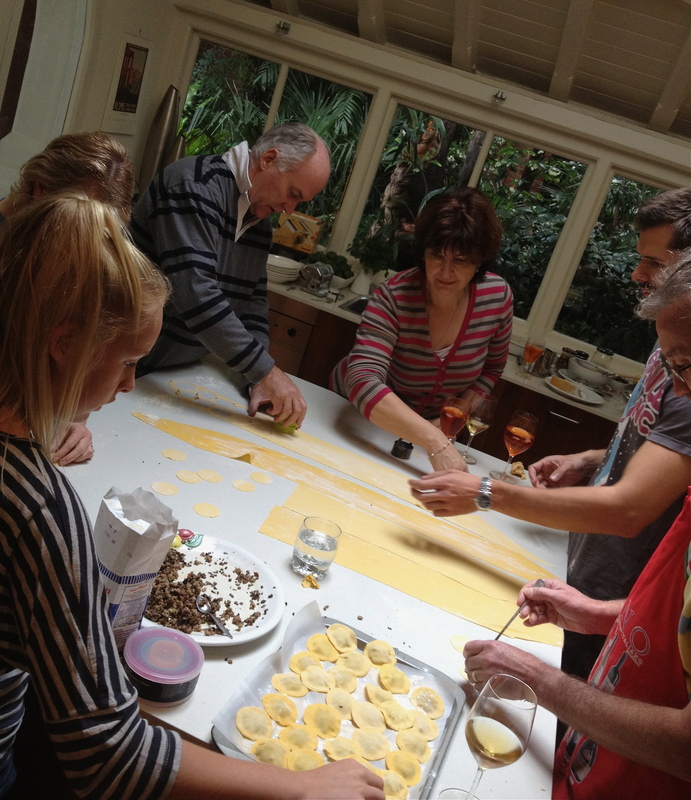 At one stage there were seven of us helping out – cutting the circles of pasta with a cookie cutter and stuffing the agnolotti. It was reminiscent of those italian family celebrations where everyone is involved in making the lunch. The filling had pork sausage, two types of mushrooms, dried porcini mushrooms, eggs and thyme. It was quite a pasta production line! We cooked the agnolotti in plenty of salted boiling water and served them with extra virgin olive oil, shaved parmigiano and truffle oil. We scattered some thyme, baby parsley and a bit of left over stuffing on top of the agnolotti. They looked beautiful and tasted even better. The truffle oil enhanced the flavours of the pork and mushrooms in the stuffing and the pasta was soft and rich. Of course there was flour and egg shells everywhere but it was well worth it. It was a fabulous pasta-making affair! Greetings from Serbia! My mom was Italian, I love pasta, my children do so and now even my grandchildren! When no idea what to cook, I make pasta and everybody enjoys!!! With tomatoes, pesto, spinach or just cheese…But I must purchase a pasta making machine !!! I love your blog, continue the great job.